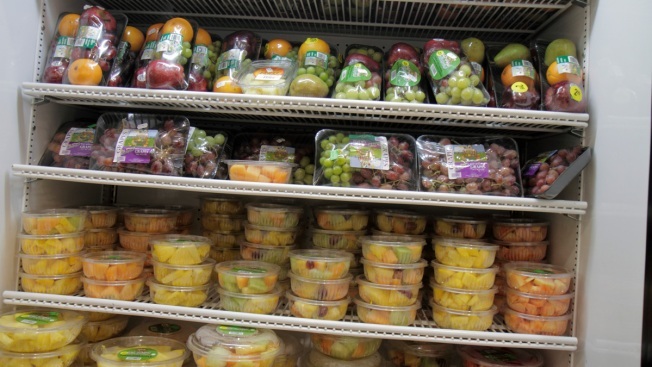 Shelves of packaged fruit for sale. An Indianapolis-based company has issued a recall for melon products sold in 16 states after being linked to a salmonella outbreak. The U.S. Food and Drug Administration said Friday that the recall includes cut watermelon, honeydew and cantaloupe produced by Caito Foods LLC. The fruit has been sold under various brands or labels at Kroger, Walmart, Trader Joe's, Target and Whole Foods. The affected states are Illinois, Indiana, Iowa, Kansas, Kentucky, Michigan, Minnesota, Missouri, Nebraska, New York, North Carolina, Ohio, Pennsylvania, Tennessee, West Virginia and Wisconsin. Click here for a full list of products included in this recall. Health officials advise consumers to check packaging to determine if the melon was distributed by Caito Foods, and, if so, not to eat it. They advise stores to pull the products from shelves. Authorities say 93 people have been sickened, 23 of whom were hospitalized. No deaths have been reported. Salmonella Carrau is described as rare. Symptoms include diarrhea, fever and abdominal cramps.